Because of family issues I am selling this Fletcher Speedboat. Great motor, Just spent £550 on a new axle so will tow anywhere (never seen water). Quick sale required, cash on collection, viewing welcome. Good batter, power trim, ropes etc. Two fuel tanks. Small damage to bump stop as in photo. I will take £2,500. This is £1k less than it owes me but as I said it has to go and soon. On 13-Sep-18 at 09:05:12 BST, seller added the following information: I have a full winter cover for the boat. It has new tyres and wheels. On 18-Sep-18 at 08:35:48 BST, seller added the following information: I have lowered the reserve price to make sure I sell the boat this week. Also I will give the winner a ski pole and 4 life jackets. 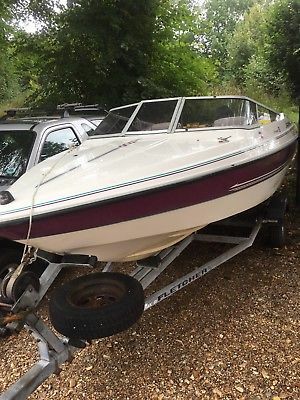 On 21-Sep-18 at 15:44:26 BST, seller added the following information: THIS BOAT IS NOW SOLD PLEASE DO NOT BID!! !